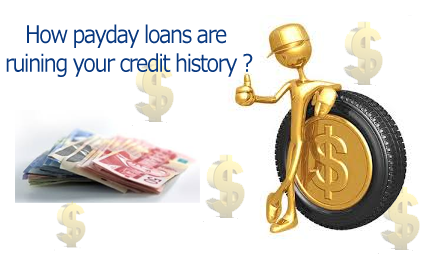 How payday loans are ruining your credit history ? Payday loans as name implies, they need to do something with your salary day. Repayment on that day, this is what they do. To handle emergency expenses, people may run out of cash sometimes in this expensive world. Online short term payday loans always stay forward to lend instant cash in such type of situations. Application forms are available online. A borrower just needs to fill out online form along with present bank details to apply for these quick loans. Loan is sanctioned in one day if all goes well as everything is done on quick basis keeping in mind urgent money requirement of borrower. Nothing is available cheap or free of cost to give instant service. If payday lenders are lending you something on such a short notice, then it is very obvious that they will demand something big in return and that is large interest rates. Even if consumer uses credit card facility, it is cheap than these loans. Interest rates can even reach to 500% in some cases and stays approximately 400% in most cases. What if a consumer in borrowing $1500 for a year then he will be supposed to payback almost $19000. And if he tries to payback same month on salary day, then it is also difficult to arrange $1550 in only two weeks. In such situation, different things can happen. Firstly he may fail to payback. Secondly he may apply for another short term loan to cover up previous repayment. But in both cases, debtor will be suffered badly unless he cracks some big lottery. This can further build up debt trap for borrower. Other affect is long term loan cycle. Whatever the consequences are, final result is bad credit score which can completely ruin your credit history. Though. Extended time is offered to debtors to pay back money but that too with extra fee charges. Thus, there will be more debt. Loan debt will be definitely uncontrollable at the end. The consumers taking advantage of short term loans to handle their urgent expenses feel them very easy to obtain in the beginning. In future if they face same problem, they again plan to borrow same loan. Thus they get addictive to these loans. In beginning this addiction is good. But finally it ruins roots of your financial career. It only ends up into never ending economical crisis. If looked at broadly, payday loans provide no solution at all. They just spoil credit history by increasing debt. If you want to get rid of financial harm, then it is better to consult some financial advisor instead of taking loan. Although online short term loans are also available for poor credit holders. They are available under name of bad credit loans. These loans demand some sort of guarantee in order to lend you cash. Borrower is supposed to set any of his property in the form of collateral in order to get money. This collateral may comprise of his current house, any automobile. If borrower fails to pay back mortgage amount, Auto loan or any other personal loan then his collateral will be taken away from him to compensate loan amount. To stay away from further financial stress, people generally opt to close bank account through which they are carrying out loan transactions. That is again illegal attempt. So they may be charged with some legal implications. If he does not do so, even then he will be punished as his credit report will be send to national credit bureau that will generate bad credit history against you. Result is financially sick life that may be very difficult to mend anyway. A consumer can stay away from financial crisis and poor credit score if he will understand following tips: – 1. Stop nuisance expenses To maintain healthy credit score, you must be economically sold. It is statistical report that people who are spending their cash wisely bear good financial status. Today’ world is full of technical and amusement resources. Mostly youth is running behind them without looking at their bank balance which is worst thing. Thus, parents should teach their children to stop those unnecessary expenses so that economic life can stay balanced. 2. Try to have savings Another good habit is to save some bucks every month from monthly salary. Open a different saving account in any bank and deposit little money in that account on monthly basis. That money can be used in emergency cash needs instead of asking for high rate loans from any borrower. 3. Follow budgetary measures Budgetary is analyzed as best financial measure. It is very common that earning hand of family knows about all domestic and social expenses related to his family. So he should plan accordingly to spend his salary on various expenses. He can prepare a written budget and spend cash accordingly. It will help him to avoid unwanted expenses. 4. Leave good impact on financial dealer If every above option fails to help you in arranging enough cash to deal with immediate money calls, then you can apply for short term loan. Application process will take less than one day. The only responsibility of lender is to deliver you cash as soon as possible. Payday lenders are very good at doing so. Borrower’s duty is to payback on time along with implied interest. This will certainly leave good impact on your creditor and he will prepare good credit score in your favor. 5. Try to put more in down payments If you are going to buy something new on installment basis, then it is advisable to pay more in down payment so that remaining balance can stay little and could not give you any financial stress. Finally there will be no need to borrow money from anywhere and you will stay financially fit. 6. If no other option is left, try credit cards Circumstances are always unfortunate. If every above option fails, then try for credit cards provided you have some time to wait as they take some days to reach you. These cards charge you very less interest rate as compared to payday loans. Shopping with credit cards is very flexible these days.